Martha Cotton is a Managing Director with Accenture and leads Design Research for Fjord, Accenture’s Digital Design agency—the largest agency of its kind in the world. She has over twenty years consulting experience, working as an applied ethnographer across multiple industries and collaborating with a range of practitioners including designers, engineers, business analysts, marcomms, and brand strategists. Prior to joining Fjord, she was a partner at gravitytank and led the Design Research practice. She also served as gravitytank's CMO for two years. Past experience also includes leadership roles at HLB, Hall & Partners and Sapient. 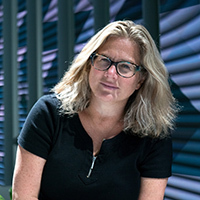 Martha is on the faculty of Northwestern University's MMM program--the Kellogg School of Management's marquee Design Thinking degree--where she developed and now teaches the Design Research curriculum. Martha has spent her career studying how everyday people engage with products, services and brands, as well as helping her clients work differently and with a human-centered lens. She has conducted deep ethnographic research around the globe and across every industry you could imagine from Automotive to Zippers and everything in between. As she helps her clients succeed in with their innovation portfolios, much of her work also includes a focus on corporate culture change and helping organizations learn how to get out of their own way so they can be successful in their innovation goals. A frequent writer and speaker on the intersection of anthropology and business, Martha's article "The Shelf Life of Data" appears in "The Handbook of Anthropology in Business" (LeftCoast Press, 2014. Denny, Sunderland editors). She holds a BA in English from Indiana University, and an MA in Performance Studies from Northwestern University. She is also the author of “Dinner Dates: A Cookbook for Couples Cooking Together” (Avon Books 1999).